The Diary of a Sower: First approved Marian apparition in the United States! First approved Marian apparition in the United States! ﻿ Things have been so hectic lately that I forgot to mention some exciting news that happened a couple of weeks ago. 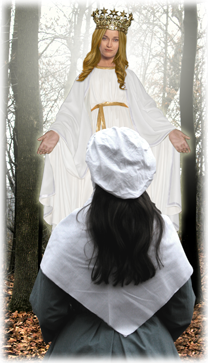 On the Feast of the Immaculate Conception (December 8) Bishop David Ricken of the Diocese of Green Bay, Wisconsin, announced that he officially approved the Marian apparitions that occurred in the late 1850s in rural northeast Wisconsin, near the town of Champion. These are the first approved Marian apparitions in the United States. It's amazing how God works. I was recently pondering the many apparitions of Mary around the world, such as those that occurred near Mexico City, Lourdes and Fatima. I wondered why there had never been any apparitions in the United States. God answered my question on December 8. He answered it in a big way for me! This site is not in Hawaii, Florida, Alaska or some other distant state. In fact, it is in my neighboring state of Wisconsin! But even more amazing to me is the fact that these apparitions seem to be directed especially to catechists, homeschooling parents, or any Catholic parent who wants to instill the faith in their child. In these apparitions, Our Lady appeared to Adele Brise and asked her to teach the children “their catechism, how to sign themselves with the sign of the Cross, and how to approach the sacraments." I've always taken my role of catechist very seriously, striving to help the children in my classes develop a personal relationship with Jesus. But lately, it's seemed harder than ever, and I've wondered if I really ever reach the children. This apparition has given me a renewed passion to teach the faith! You can find out more about this apparition on the Relevant Radio website. You can also check out the Shrine of Good Help, which is located near the place where Adele Brise saw the apparitions. By the way, I think I've found the inspiration for my next yogurt cup saint! What did you find in your shoes this morning?